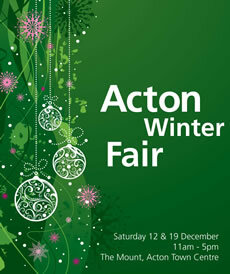 This is the perfect chance to get started on your Christmas shopping or just come along and browse the stalls in Acton market. You will find a range of food and gifts with a Christmas theme. Throughout both days there will be free entertainment for adults and children. • Arts and crafts activities, in the marquee, The Mount. • Free mince pies and non-alcoholic mulled wine. Plus at both events there will be carol singers from Churches Together, free face painting and a Santa’s grotto with a free gift.